Welcome to the website for the re-enactment group of the 19th Light Dragoons. The 19th Dragoons E Troop were a mounted troop stationed south of Montreal during the war of 1812. We bring history alive by re-enacting battles across North America. Check out Events above to find an event near you! If you find yourself wanting more, click HERE for our sister site (XIXLD, B Squadron). If you have an event that you would like the Dragoons to attend, click the button bellow and let us know! We would love to hear from you. We have horses and will travel! The Dragoons were raised for service in India. When hostilities there ceased they retired to Ireland. At the outbreak of American aggression the Regiment was sent to Canada. They arrived in Mid 1813. 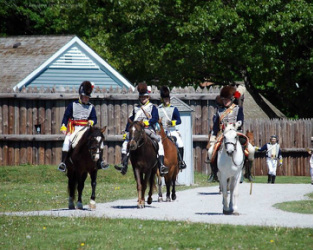 They were the only British Line Cavalry to serve in Canada during the war of 1812. They were also the only British Line Cavalry to serve in a mounted role in North America during the war (with the exception of about 20 men from the 6th Inniskilling Dragoons). They did however serve with several mounted Provincial Dragoon Regiments from the Canadas. Of the five Squadrons belonging to the unit in 1813, three were sent to Canada. Two went almost directly to the Niagara region, 1st and 2nd Squadrons. 3rd squadron stayed south of Montreal playing a large part in thwarting the incursions of the Americans towards Montreal and Quebec city. The 4th Squadron followed in 1815. The 5th Squadron acted as a replacement depot in Ireland.